Most of Technology Blogs use some Syntax Highlighter. In This Article the Methods to Customize WordPress Inline Code Shown With Needed the Snippets. We use Crayon WordPress Syntax Highlighter. That plugin actually supports inline code capturing with the fancy name of the feature – Inline Tags. There are options to Wrap Inline Tags, Capture code, Capture backquotes / backticks etceteras. Obviously we want something more manual to give power to the users. There Are Many Ways to Customize WordPress Inline Code to Look Them Pretty Nice Like Twitter Bootstrap. In our older guide we to convert backticks to code with simple PHP snippet. Secondly, we have easy to use user customizable WordPress Plugin which was originally for managing all the stuffs we ever need to add to Theme or Child Theme’s function.php file. As you can see, when we wrote wp_add_inline_style, the formatting is basic. Everything on this Earth can be modified with inline CSS and a custom class, even logically used with plugins – like we did for adding drop cap to this post. Backticks will become automatically code – that is your matter how which method you will use. Inline Code Block will have funky colors on need – we are talking this. Pseudo method – as using the inline CSS ONLY not really doing the real work of wrapping with code. Does Customize WordPress Inline Code Means Using Inline CSS? TinyMCE plus a syntax highlighter perform that complicated work. That is why if you switch between Text and Visual mode, the formatting usually get lost. Not impossible – <code> but impractical. It is rediscovering the need of WYSIWYG html editor. Another point is that – wrapping with code or pre will force to look the wrapped text different from the rest of the text even if CSS is not loaded. What’s New We Read From Your Customize WordPress Inline Code Post? Known Things! That type of kind of code is actually for drawing the attention, like for example – run apt update && apt upgrade. There is no actual difference if we use real code to separate apt update && apt upgrade from the normal text of a sentence. This usage is not to escape the issue with non web safe characters. We could use italics or bold. But, sadly looks too much ordinary, mean something different and Google may think it as spam. Our typography is a bit different than that of Twitter Bootstrap, we need to increase the font-size: 110% !important; and change the font-family. We can create a Button on WordPress Text Editor – simple highlighting the text and clicking the button will add the style or we can create a custom shortcode to manually wrap the text. We should end the article here! This Article Has Been Shared 5734 Times! Disable W3TC Plugin for Nginx PHP5-FPM with Database Caching ON. WordPress W3TC Plugin Disable For WordPress Update When Stuck or Hanged. 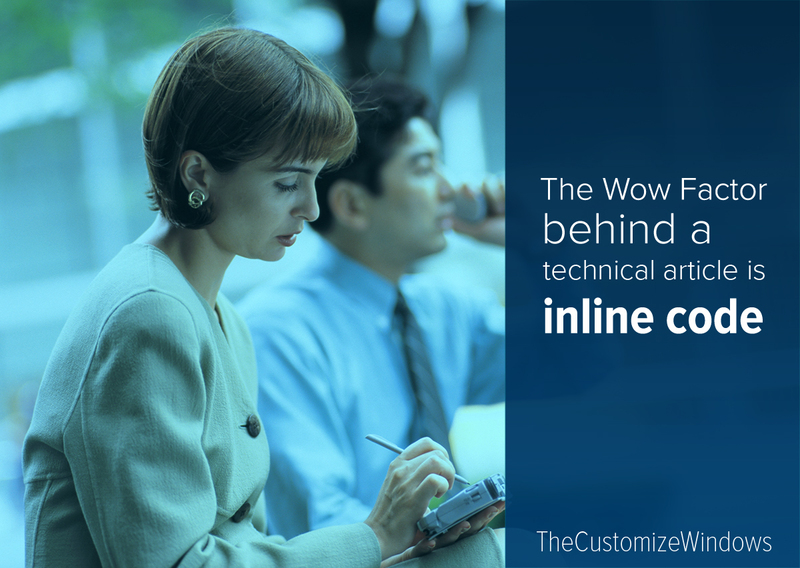 Cite this article as: Abhishek Ghosh, "Customize WordPress Inline Code," in The Customize Windows, November 13, 2015, April 23, 2019, https://thecustomizewindows.com/2015/11/customize-wordpress-inline-code/.